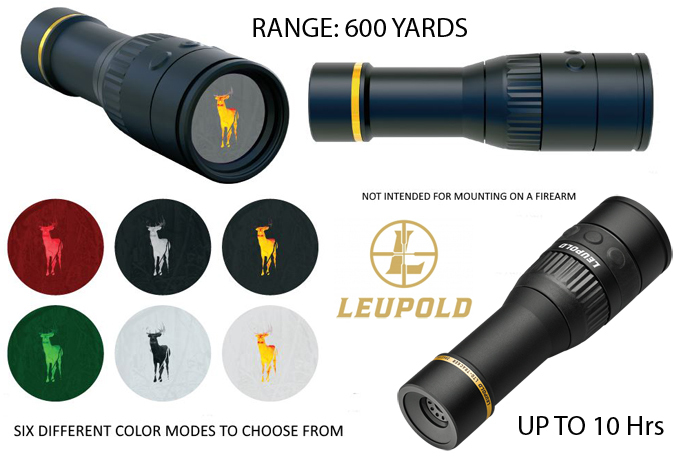 LEUPOLD HAS ANNOUNCED ITS FIRST HANDHELD THERMAL OBSERVATION and game-recovery tool called the LTO Tracker. LTO stands for Leupold Thermal Optic, and according to the company, the LTO Tracker's state-of-the-art thermal-imaging engine provides exceptional image quality, fast 30Hz frame rates, and detection of heat sources out to 600 yards. The LTO Tracker is intended for use by big-game and varmint hunters where legal. Such uses include helping a hunter make a stealth approach to a stand or a blind with minimal risk of scaring off game, identifying where varmints and feral hogs are located, and tracking a quarry's heat trail to more quickly and efficiently recover the downed animal. The LTO Tracker features a user-controlled reticle, a 21-degree field of view, and a 6X digital zoom. Six thermal color palettes (red, green, white hot, black hot, white highlight, and black highlight) allow the user to choose the view that's most beneficial. The LTO is powered by a single CR123 lithium battery, with battery life reaching up to 10 hours of continuous use. The unit has a fast start-up time (less than three seconds) and a powerful sensor that's effective from -4 degrees Fahrenheit to 140 degrees Fahrenheit. It's waterproof to IP67 standards and is built in the United States. It weighs less than 10 ounces and is 5.6 inches long. The LTO Tracker is designed to allow users to find downed game in dense brush, scout pests and predators at night, and enhance situational awareness.